Steve's note: I believe stocks can still go higher from here. But if you're worried about when the boom times will end, you can still profit... and take steps to prepare. Yesterday, my friend and colleague Porter Stansberry warned that a "Debt Jubilee" could be on the horizon. Today, he digs into the consequences of past Jubilees in America... and shares how you can protect yourself. In 1933 – in order to deal with mounting debts and print money to pay for dozens of new social programs – President Franklin D. Roosevelt made two extraordinary changes to the financial system. First, he closed banks for four days and forced Americans to turn in each ounce of gold they owned for $20.67 in paper money. Then the government raised the price of gold, wiping out 69% of the savings of anyone who followed these rules. Roosevelt also eliminated the "gold clause" in all contracts, including loans, bonds, and other financial instruments. You see, at the time, people were worried the government might inflate away the value of their money. So they added a gold clause, which said repayments could be required to be made in gold. These gold clauses were in federal loans, bank deposits, insurance contracts, and other private agreements. When Roosevelt outlawed the gold clause, he stole billions from investors. In fact, a Harvard paper estimates this rule took $700 million a year from private investors who bought government bonds. Billions more were stolen from folks who lost money from the elimination of the gold clause in private contracts, bank accounts, and insurance deals. Eliminating the gold clause was so controversial, investors sued the government. The case went to the Supreme Court. Roosevelt was terrified his Debt Jubilee would be overturned. He even drafted a speech saying he would ignore the court if it ruled against him. But his political pressure worked, and the court ruled 5-4 in Roosevelt's favor. Tens of millions of Americans lost massive amounts of their savings. And after booming, the stock market soon fell 50% in a single year. Investor confidence was crushed. Supreme Court Justice Harlan Fiske Stone vowed he would never buy another federal bond. We had another Debt Jubilee in America about 40 years later... Starting in the late 1960s, we saw another populist uprising... a combination of economic and social upheaval. If you're old enough to remember, think about the anger and resentment of the 1960s. The Black Panthers' slogan was: "Power to the People." The idols of the day were people like Latin-American guerrilla leader Che Guevara, Malcolm X, and Muhammad Ali. Small farmers fought banks and railroads... Union workers battled their bosses and federal judges. On college campuses, students fought anyone with authority. Election rallies routinely ended in violence. Things were so bad, Lyndon Johnson decided not to run for re-election. Martin Luther King Jr. and Robert Kennedy were assassinated. In 1968 alone, there were violent uprisings in more than 120 U.S. cities. A few miles from where my company is headquartered today, thousands of National Guard troops and 500 state police officers were brought in to quell the violence and looting. The government had borrowed extraordinary sums, and we were having a hard time repaying creditors. That's because at the time, every dollar was required to be backed by $0.25 worth of gold. So the government couldn't print unlimited amounts of money out of thin air. Also, foreign creditors who owned U.S. government bonds were allowed to collect repayments in gold bullion instead of dollars... so our gold reserves were quickly disappearing. Get this: Between 1958 to 1968, 52% of America's gold reserves left the country in the form of repayments for our debts. The government was scared. It knew there was only one way out... another Debt Jubilee. First, we eliminated the 25% gold backing of every dollar. Then, in 1971, President Richard Nixon completely defaulted on our promise to pay gold for dollars to our foreign creditors. Once again, the government simply wiped the slate clean. No one could redeem dollars for gold any longer. This allowed the Fed to print as much money as it needed to make payments on our debts. In the 1970s, the U.S. dollar lost 30% of its value over a several-year period. Inflation more than doubled. And the stock market fell 48% in less than two years. Unemployment was around 10%. And, believe it or not, the Federal government got so desperate that it issued "Carter Bonds" denominated in Swiss francs because the U.S. dollar could no longer be trusted. Once again, the stage is set for America's next Debt Jubilee. We are living in a world of two different Americas. For the wealthiest 40% of the population, life is good. Asset prices are rising... and wages are finally starting to increase. For the bottom 60% of America, consumer debt is high and wages are stagnant. Most of these folks would have difficulty raising even a few hundred dollars for an emergency. These folks have less than $20,000 on average saved for retirement. Physical and mental health is deteriorating. And death rates are soaring. Premature deaths are up by 20% since 2000. The biggest contributors to that change are an increase in deaths by drugs/poisoning (up two times since 2000) and an increase in suicides (up over 50% since 2000). That is the definition of hopelessness. The concept of a Jubilee comes from the Bible (The Old Testament), the Book of Leviticus, Chapter 25. A Jubilee in the Jewish tradition was said to occur roughly every 50 years. It was a time for total forgiveness of debt and the freeing of slaves. Pope Boniface VIII proclaimed the first Christian Jubilee in 1300. And rulers throughout history have occasionally used a Jubilee to reset the financial system – especially when the poorest citizens are threatening revolt. But this Jubilee will be different from the 1933 and 1971 ones we've discussed. The federal government is free to print all the money it needs to pay government debts. Private households are different. The only ways out of private debt are to pay it, to default, or to have it forgiven with a Debt Jubilee. Today, America's low-income households don't have the funds to service the money they owe. It's mathematically impossible. And politicians will never allow tens of millions of our poorest citizens to go bankrupt. So the only solution left is a Debt Jubilee. Back then, the laws were temporarily changed, so debtors could be discharged of their debts – without the consent of the creditors. Over a period of 13 months, more than 40,000 people wiped away their debts before the act was rescinded. Millions of investors, pensioners, insurance customers, and creditors will lose a fortune. Stocks will collapse. Dozens of companies will go bankrupt. I'm not saying this to scare you. This is simply the reality we face. The Jubilee is already starting. Protect your financial accounts. Get out of the common investments that are most likely to get crushed. Focus on ways to profit while everyone else loses their shirts. "The hatred and anger is like nothing I've witnessed in my lifetime," Porter writes. "And it's coming from all sides." To learn more about how economic inequality is fueling the next Jubilee, check out yesterday's essay: A Major Jubilee Is Coming to America. "A huge number of Americans have borrowed more money than they can ever dream of repaying," Justin Brill explains. He delves into one of the biggest reasons behind the growing debt crisis right here: Why Millions of Americans Feel They Have Nothing to Lose. The growing threat of digital sales has forced video game store GameStop (GME) to get creative. The company launched a new business segment in 2013, acquiring more than 1,000 stores certified to sell Apple (AAPL) and AT&T (T) products and services. These big tech brands are popular with consumers... 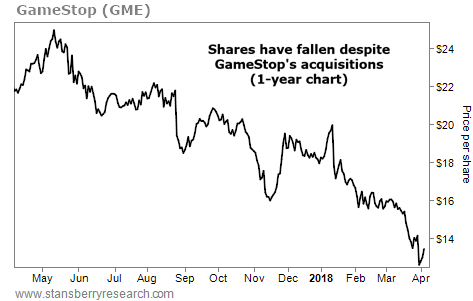 But lately, GameStop's strategy has fallen short. During the most recent quarter, sales in this segment fell 14%. And this year, management is calling for a sales decline of 2%-6% across all segments.